If you're looking for a new 2018-2019 and used Chevy dealer in the Baltimore area, you've come to the right place. At Koons White Marsh Chevrolet we have a wide selection of new and used vehicles available for you to choose from, and we also offer some excellent services to take care of your auto financing and car maintenance needs as well. So no matter what your Chevy needs may be, we can take care of them here at our dealership and we will do everything we can to make sure you have a great experience along the way. We have an extensive inventory of new 2018-2019 Chevy models available at our dealership and we think there's a model for every driver. You'll find all kinds of cars, trucks and SUVs including models like the Equinox, Impala, Trax, Traverse, Malibu, Silverado and many more. So whether you're looking for something efficient, spacious, powerful or tough, we have a new 2018 Chevrolet that will be a great fit for you. Our staff would be happy to help you find the vehicle that's right for you, and you can expect a competitive price on any model you choose. If you're looking for something even more affordable, then one of our used cars could be a good fit for you. These vehicles include used Chevy models as well as a variety of other makes and models as well. Each vehicle has been carefully inspected to ensure all our used cars are in excellent shape so you can enjoy a safe and confident ride. These vehicles are also offered at great prices that we think your wallet will appreciate. When you find he vehicle you want to take home, new or used, be sure to pay a visit to our finance department. We have a team of finance experts who would be happy to help you get the auto loan or lease you need to get behind the wheel of a great new car. We have experience working with all kinds of customers and all kinds of budgets, so we know just how to help you get the assistance you need. We would be happy to answer all your questions and help you find the financing solution that works best for you. Once you're behind the wheel of your new car and you're out on the Baltimore area roads, you can count on us to help you keep your vehicle in great shape. At our service center, we will take care of all your maintenance and repair needs. We have a top-notch service facility and a team of highly-skilled technicians who will gladly take care of your car. We can help with things like oil changes, vehicle inspections, brake repairs and much more. With our help, your car can stay in great shape for longer so you can keep enjoying an amazing ride for many more miles. 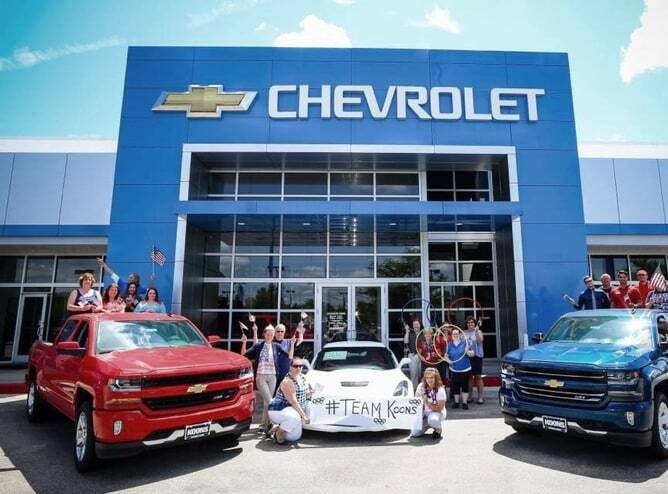 To find out more about Koons White Marsh Chevrolet, feel free to give us a call or pay us a visit at our White Marsh, MD dealership serving the Baltimore, Ellicott City, Towson and Bel Air area. We would be happy to answer all your questions and then help you get started on taking care of all your Chevy needs from finding a great new car to keeping that car in great shape for many more years. Visit us at any time and we'll help you get started.